I love potato salads, but I don’t always want the creamy or mayonnaise dressing that frequently goes with them. This one uses creamy avocado instead. The lemon cuts through the richness with just the right amount of acidity and the dill adds it’s fragrant mellowness as a high note. A handful of ingredients, very little prep and a great taste at the end of it. This is my kind of cooking. Put all the ingredients into a bowl and season with salt and pepper. 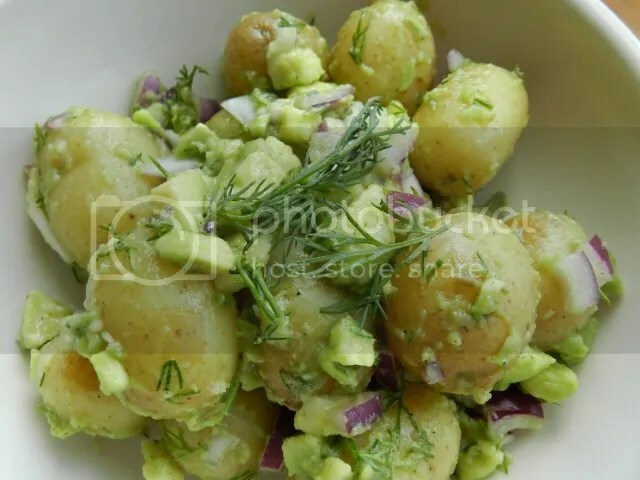 Mix together thoroughly until the avocado starts to break down and little and coat the potatoes. It’s that time of the year again! Spring! Green leaves. Daffodils and primroses! Nesting birds! And asparagus! It’s early this year. I picked some up at my local deli where they sell three bunches for a fiver. It would be rude not to buy some. This is based on a St Delia recipe – and one that’s been something I’ve taken to barbecues for years. 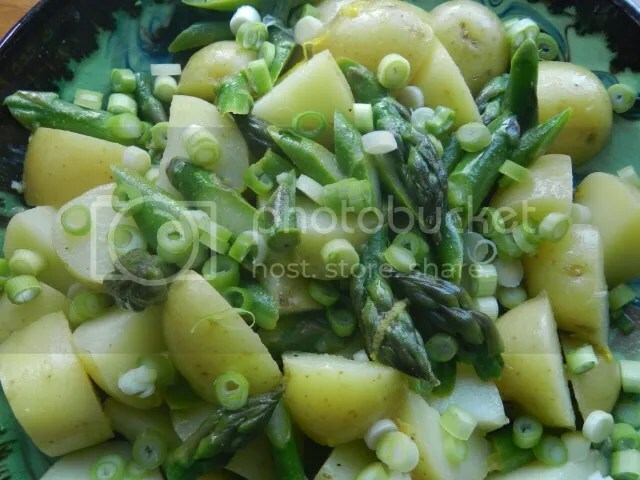 The asparagus stands up well to the fresh flavours. I’ve left the herbs out of this version, but a little tarragon would go nicely if you wanted to add a bit more flavour. Boil the potatoes for 10-15 minutes, or until tender. Add the asparagus pieces to the pan and cook for a scant two minutes. Whisk the lemon juice, zest, mustard, garlic and olive oil together in a bowl. Season well with salt and pepper. Drain the potatoes and asparagus. Put in a serving bowl and toss with the dressing. Scatter the spring onions over the salad before serving. I think this is one of the best ways of cooking potatoes. It’s wonderful mixture of fried potatoes and roast potatoes. The trick to cutting the slices in the potatoes is to put them into the bowl of a serving spoon (not one you’re going to use for best anymore!) and cut the thin slices until you hit the side of the spoon. That way you’re not in danger of going all the way through the potato. Give these a try – they’re a lot easier than they look and they taste better than they look! Pre-heat the oven to 200C. While the oven is coming up to temperature, put each potato in the bowl of a serving spoon and make slices across the width of the potato at 1-2mm intervals. Put the roasting tin on the hob and heat the olive oil. Toss the potatoes in the hot oil so that they’re all coated and then put in the oven cut sides up. Roast for 40 mins, but give them a check after 30. To serve, sprinkle over the dill and the salt. Serves 2 as a generous side dish, although I have been known to eat a whole batch to myself. 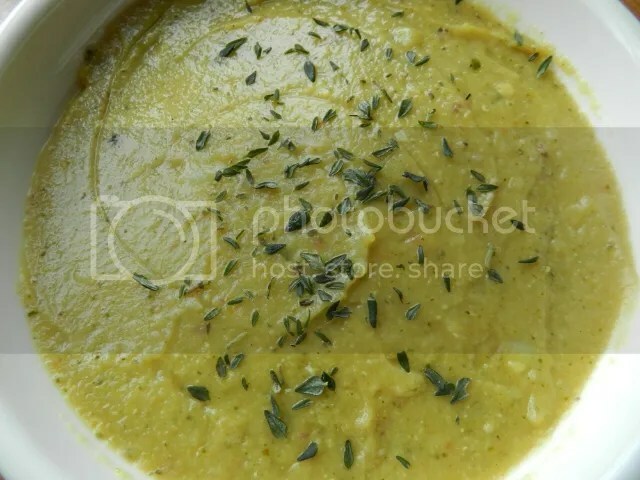 I like vegetable soups, but too often they are a bit unsatisfying to me. So, faced with a fridge drawer full of vegetable oddments, making a soup was a no-brainer but adding lentils to it makes it a lot more substantial. This is a lovely, warming, satisfying winter warmer. It’s so good, you won’t even notice that it’s fat-free as well! Add all the ingredients, apart from the thyme, to a large saucepan and bring to the simmer. Skim off any scum that appears on the surface. Cover and simmer for about 30 minutes. Season with salt and pepper and blend until smooth. Add more boiling water if it needs thinning down. I shuffled my feet and confessed that while I’ve been ill, my eating patterns have been very patchy. So I left the surgery with a promise to take Folic Acid supplements and to get down to the supermarket and stock up on spinach, kale and the like. And so far I’ve been pretty good about eating my greens. I’ve been looking for recipes which are quick and easy, as I don’t always feel up to cooking, and which incorporate ingredients likely to tempt my suddenly very erratic and fussy appetite. Which leads me to mashed potato, my go-to comfort food. And courtesy of my brother and Nigel Slater, I’ve found two fabulous ways of using leafy greens. I was perfectly happy with them as they came, but you could also use them as accompaniments to veggie sausages or even a nut roast. Make up as much mashed potato as you can scoff. Plain with just butter/milk works best for variation 1. For variation 2, I mixed in a touch of wholegrain mustard and some finely-grated veggie parmesan. I always use industrial amounts of black pepper! When the potatoes are almost cooked, shred the cavolo nero fairly finely. I’m not used to frying stuff in butter, but I have to admit it did taste good when I cooked the greens in it – they need four to five minutes until they’re tender. If it’s very stalky, cook those first, then addd the leaves for last minute or two. Tip the cavolo nero out and crumble the cheese into the pan (use some more butter if you want to) and let it melt slightly. Nigel Slater’s recipe involved finely chopped rosemary leaves cooked in the butter before you add the cheese, but I didn’t have any to hand and I thought the recipe was fine without it. Mash the potatoes, make a well in the middle, then pile on the cavolo nero. Tip the blue cheese (and any juices left) over the mash. Cook and mash the potatoes – and this recipe is more fun if you add something to the mash. My brother recommended strong cheddar or wholegrain mustard, but I’m trying to limit how much cheese I have, so I went for about half a teaspoon of wholegrain mustard, and a couple of tablespoons of vegetarian parmesan. It’s easy to make this variation vegan by using dairy-free spread, and by leaving cheese out of the mash. You could maybe chop spring onions finely and add them instead, or make garlic mash, or even use some horseradish. Wilt the spinach and lift out of the pan. Add the juice of half a lemon and a knob of butter to the liquid and whisk. 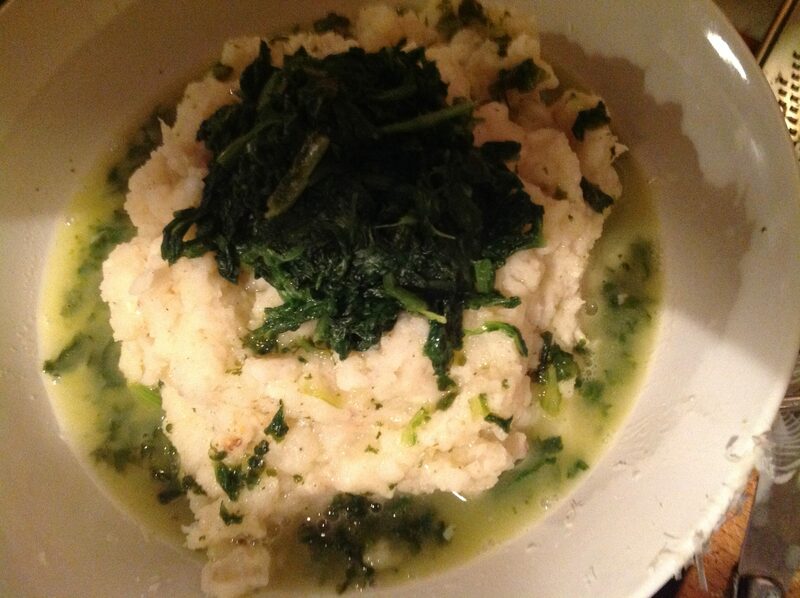 Make a well and tip the juices over the spinach and the mash. This second variation is in the photo – and apologies for the shadows. That’s what comes of trying to take pix on a winter night! I like baked potatoes. I really, really like baked potatoes. I was always the one first in the queue for the baked potato stalls at music festivals (followed by a swift rush over to the crepes one for afters!) If you’re vegetarian, though, you get a bit bored with cheese and beans, or cheese and coleslaw, or cheese and onion (guaranteed bad breath, that one) or the dreaded cottage cheese and pineapple. If you’re vegan, it seems to be beans, beans, beans or hummus. So here’s one vegetarian and one vegan suggestion for when you want a comfort supper with minimal effort. I think the original recipe for stuffed baked potatoes came from Delia Smith, but I wouldn’t swear to it. Whatever, it’s dead easy to make and I’m sure you can think of variations on a theme. When the potato is baked to your satisfaction, scoop out the insides and mix with Boursin or whichever soft cheese you prefer. I always use garlic and herbs variety, but I’m sure the others would work (well, dunno about the fig one …) Loosen the mix with a drop of milk, add salt and black pepper, then pile back into the skins. I chop some leeks for the top, then put the potatoes back in the oven for ten or 15 minutes to warm the filling through and turn the leeks slightly crispy. You can eat it as it is, or with a side salad. Rocket and watercress are nice, sharp counterblasts to the creamy filling. The vegan filling is mushrooms and beans (not the baked variety). It came via my sister-in-law, Maria, and may be from Weightwatchers originally. She did it with tinned kidney beans and tinned mushrooms. I’ve never used tinned mushrooms in my life and don’t intend to start now, so I just fried some mushrooms (olive oil or low-cal spray, depending on your weight-watching status! ), warmed through a tin of mixed beans (the ones in a slightly spicy tomato sauce are best, or it’s all a bit bland) and then added the lot to the baked potato. A knob of butter might have sneaked in there as well. And it’s extra tasty served with either cranberry or apple sauce. I liked the green olive dressing from the asparagus and egg recipe so much that I had to find something else to use it in. Warm new potatoes absorb the flavours perfectly. 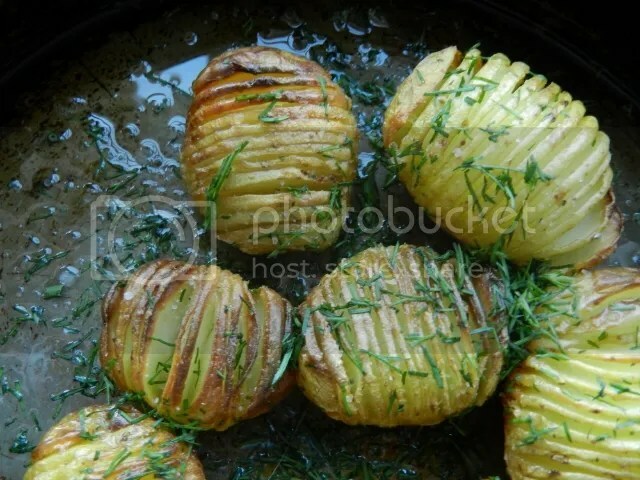 Cook the new potatoes in plenty of salted boiling water for 10-15 minutes. While they are cooking, mix the dressing ingredients together and season well with salt and pepper. Once the potatoes are cooked, drain them and then cut them into quarters. Put them into a bowl and pour over the dressing and stir. There will be too much dressing for the amount of potatoes, but that’s fine, you’ll be adding the avocado later. Cover the bowl and set aside, letting the potatoes absorb the dressing. Once the potatoes are cool and you are ready to serve, peel and cut the avocado into slices, or into chunks depending on your fancy. 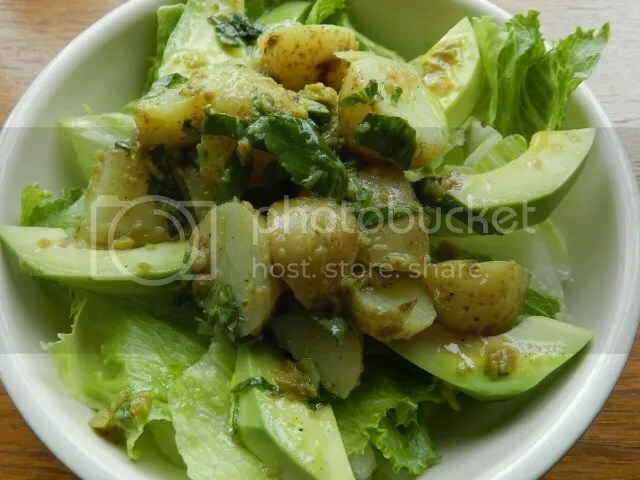 Carefully stir the avocado into the potato and dressing mixture, getting it nicely coated. Serve on a bed of the crisp lettuce. Serves 2 as a starter. If you wanted this as a main course, I would double the amount of potato and possibly add some hard boiled egg slices on top.